Livonia James Hardie Siding | Livonia James Hardie | Livonia James Hardy Siding | Livonia James Hardie Fiber Cement SidingMcGlinch & Sons CO.
Moisture can bring about rot. Consequently, rain, snow and humidity are all harmful to your home if you have wood siding. However, moisture can also be hazardous to homes with vinyl siding because it can seep behind panels since vinyl is not snuggly nailed to your home to allow for expansion and contraction when the temperature changes. As a result, if you have wood siding or vinyl siding, you can have moisture problems that can precipitate other, more serious problems like R-O-T! This is why McGlinch & Sons Co. Home Improvements recommends to its customers throughout the Greater Detroit Metropolitan Area and Southern Michigan that they invest in the best siding in the industry – James Hardie Fiber Cement Siding. Not only does James Hardie Siding safeguard your home against rot, but it also protects it from hail damage and flying debris. Furthermore, James Hardie Siding can also hold up against winds up to 150 mph! 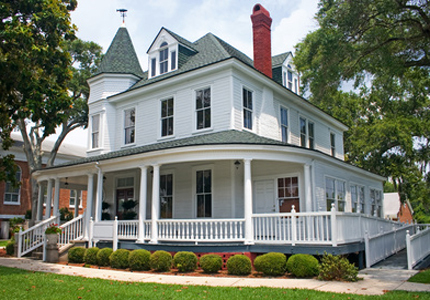 Livonia customers have been coming to McGlinch & Sons since 1917 for their remarkable James Hardie Siding. Since James Hardie Siding is five times thicker than vinyl, noncombustible, fade resistant and weather resistant, it is well known for outperforming both vinyl and wood siding. In addition, James Hardie Siding never needs scraping or repainting, and since it repels moisture, it will never rot from rain or snow or excessive humidity. After James Hardie Siding stood up against Hurricane Sandy on the Eastern Seaboard, many persons felt that if it can stand up to a hurricane, it can withstand whatever weather events Michigan has to offer! Moreover, it is not uncommon for James Hardie Fiber Cement Siding to be specified by building codes for use in hurricane-, tornado- and wildfire-prone areas. For more information about our outstanding James Hardie Siding products, call McGlinch & Sons today. In Oakland, call: (248) 987-6300; East Side, call: (586)776-8912 and West Side, call: (313) 278-2777.